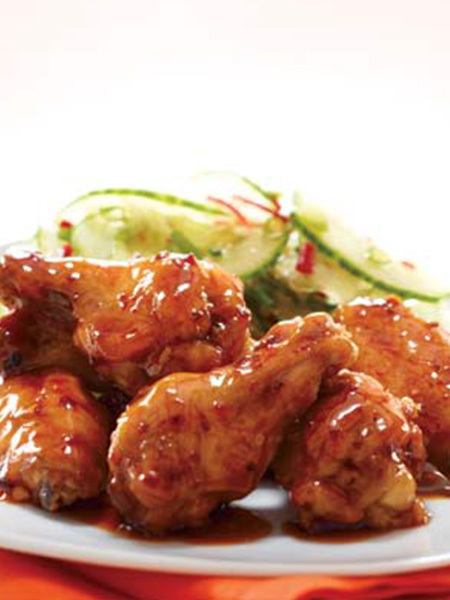 Everybody loves wings and barbecuing brings out the sweet and spicy teriyaki flavour in a brand new way. Prepare wings by washing and drying with a towel. Place wings in mixing bowl and add minced garlic and ½ cup of Teriyaki Experience Teriyaki Sauce. Mix well and let sit in the refrigerator for two hours before use. For best results, marinate for up to 24 hours. Place wings on BBQ on medium to low heat. Turn wings consistently so they don’t burn. Brush with Teriyaki Experience Teriyaki Sauce while grilling. Continue to cook and repeat procedure several times until wings are cooked. For spicier wings, alternate brushing with Teriyaki Experience Sweet Chili Sauce.